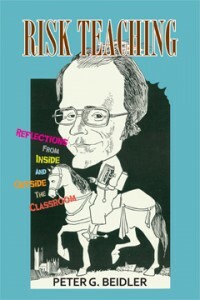 Risk Teaching: Reflections from Inside and Outside the Classroom (250 pp, $13.95, ISBN: 978-1-60381-106-4), by Peter G. Beidler, is a retrospective of an award-winning college professor’s teaching career. Both students and teachers can learn from its valuable insights. Must we always teach from the inside of a classroom? Do periodic exams encourage learning as well as daily quizzes do? Do you schedule individual conferences with each student at the start of the term? Is lecturing an effective way to teach? If a student falls in love with you—or vice versa—are you doing something right or something wrong? If you have a pedagogical idea that will probably fail, should you try it anyhow? How do we know when it is time to retire from a profession we love? Such questions may make readers uncomfortable, but they may also lead them to change the way they think about the profession. Teachers may reconsider their methods, causing students to reconsider their attitudes. In choosing the title Risk Teaching, Peter G. Beidler hopes to convey multiple meanings of the word “risk.” “Risk” the verb, as in “take a chance on an amazing profession.” “Risk” the adjective, as in “risky”—teaching that diverges from the safe and traditional path. “Risk” the noun, as in “teach students to take risks” and learn outside their comfort zones. Beidler’s book, like his teaching, is saucy, innovative, and challenging. PETER G. BEIDLER recently retired from Lehigh University as the Lucy G. Moses Distinguished Professor of English. Widely published in both British and American literature, he has won a number of teaching awards. In 1981 he was named National Professor of the Year by the Council on Advancement and Support of Education and the Carnegie Foundation. Risk Teaching is available in Kindle ($6.95) and 6×9 trade paperback editions on Amazon.com, Amazon.co.uk, Amazon.de, Amazon.fr and Amazon Japan. Bookstores and libraries can order through info@coffeetownpress.com, Ingram, and Baker & Taylor. Other eBook editions can be purchased on Smashwords, Google Ebooks, BN.com and all major eBook retailers.